From November 13 to the 13th of December 2015, several events shook the whole of France: after the attacks in Saint-Denis, and in Paris, parliament voted almost unanimously the State of Emergency; 195 country delegations to the 21st Climate Conference (the COP 21) met under high police protection, and the regional elections [happening then] changed the political landscape with a reminder, to the whole political class, that parliamentary democracy has its limits. 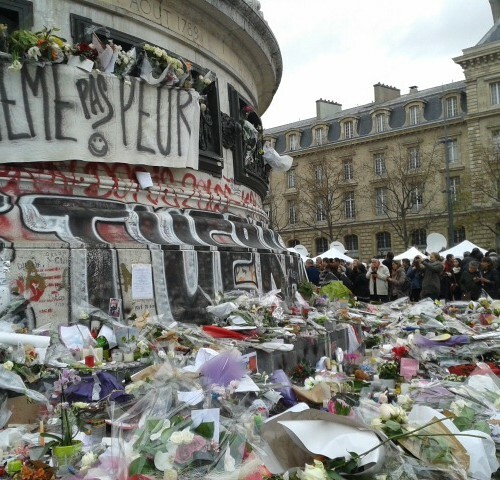 The terrorist attacks of November 13 in Paris do not differ a lot from those of January 2015 against Charlie Hebdo. The mayhem and sentiment of insecurity in the population were greater this time, but the French terrorists were apparently from the same djihadist pool. To try and bring all the political forces of right and left in a national union against terrorism, prime minister Francois Hollande declared that “the attacks are acts of war on French soil”. This plays on the fears and the emotions, but it forgets the wars that France has been conducting for several years, and on many foreign fronts, as in Syria, Iraq, Libya, Mali and other African countries. And France supports so-called “moderate terrorists” in Syria. It sells weapons to the Gulf monarchies, but these favour terrorist movements, and Daech itself (also called IS). On a one hand, these Paris attacks are consequences of the war policy of the French government and its NATO allies in the Middle East, and the result on the other hand, of the exasperation of capitalism with the military intervention of Russia in the Syrian conflict. The Russian intervention has changed the situation radically. It puts capitalism clearly in the impossibility to continue with its war aim of destroying Syria and removing the Bashar al-Assad government. These attacks signify also a new escalation of violence on the part of the French government. Showing how capitalism has no answer beyond endless war, and no answer beyond a terrorism of State that must curtail the political liberties in order to defend democracy! A State of Emergency has been decreed for 3 months without any possible debate. The day after the attacks, Hollande raised the same arguments as those used in 2001 by G W Bush after the US 9/11, to get liberty-killing measures agreed in the name of the struggle against terrorism. The State of Emergency in France means that constitutional rights and public liberties are suspended. Police and army gain exorbitant powers, and the judicial institutions are cast aside. Arbitrary searches and arrests are allowed, along with house-detention for some citizens who express concern about this government’s policies. When this came to the vote in parliament, only 6 MPs abstained and all the others accepted (3 Socialists and 3 Greens). The contradictions in the Left-wing parties are such that they take positions, in spite of their declarations, that justify this government bent on suspending all public rights and liberties. In these conditions, how are these parties going to stop the State of Emergency being used to alter the Constitution? This is what the Council of Ministers was after when it met on December 23. It proposes “a civilian regime of crisis to lead the war on terrorism” and to amend Article 34 of the Constitution accordingly. This way, dual-nationals born in France can be stripped of their French nationality. It is imperative to reject such measures that a socialist government wishes to impose. The inspiration here is drawn directly from the programme of the extreme-right. We have known this kind of thing in the France of Petain and the Vichy regime. With the State of Emergency, right-wing transgressions can become normal. It is urgent to redress the situation, for it greatly imperils the values of the Republic – equality between the citizens being one of these. In this ambiance, the COP 21 took place (the Climate Conference) under high police surveillance for the 195 countries’ representatives. The State of Emergency meant that all demonstrations and mobilisations were forbidden. The social movements were controlled as closely as the ecologist militants had been when they objected to the big and useless airport project at Notre-Dame des Landes. The Climate Coalition and the Mouvement Citoyens refused to be silenced however, and they found ways to resist everywhere in the country. 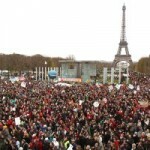 In Paris, they turned the 29 November International Climate March [banned under the Emergency laws] into a human chain along the path of the terrorist attacks. They declared a “Climate Emergency” and they protested the ban on marches by covering the Place de la Republique with shoes. On 5 and 6 December, a Village of the Alternatives was set up in Montreuil, Paris region. 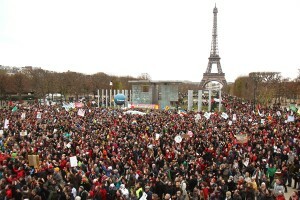 The assembly of 12 December on the Champ de Mars in Paris (pictured) was upheld to mark the closure of the Climate Conference. Over the duration of the COP 21, such initiatives had mobilised hundreds of thousands of demonstrators against the State of Emergency diktats. The demonstrators wanted their voices heard in the enormous space reserved to the so-called green business of the large enterprises and financial groups attending there. In the struggle against climate warming, they look for profitable economic niches in their own interests. The French government took all the credit for the final agreement passed at the Conference; but the resolutions taken by the 195 countries did not rise to the challenge. They were miles away from talking about the wars in the world, and their huge carbon foot-print. Not a word either about the weight of the large corporations linked to the industrial-military complex, the impact of aerial and automobile transport, or that of nuclear energy. You would think that climate change has nothing to do with human activities tied to armed forces one way or the other. In the last centuries, the governments of the rich countries kindled the fires of war all around the world – and still do. They remain unchallenged, however, when those responsible for climate change are sought out, even as they stand at the front of those who threaten the planet with all the wars they make, and the sequels of their unequal repartition of the world’s resources. In this political situation, the regional elections have thrown a particular light on the decrepitude of the policies of the socialist government, and the state of crisis in all the political parties. The National Front (NF) won 6 regions out of 13 in the first ballot (the election was in two rounds). Even with more than 50% abstentions, the NF vote increased substantially in some regions. Faced with this, the Socialist Party (SP) decided quite unilaterally to block the NF by standing down in the second round, and called on the left to vote for the bourgeois party of Sarkozy – Les Republicains (ex UMP) instead. Prime minister Valls called for this, but the general secretary of the SP agreed immediately. This placed the socialist militants in great difficulty. Their disappearance in some regions handed over the political terrain to the right and the extreme right. It also removed from the left the chance to create a dynamic of union strong enough to mobilise the abstentionists. In Alsace-Lorraine, the Socialists – who had arrived third behind Les Republicains and the NF in the first round – decided to continue to stand and make an alliance with all the forces of the left. [They did not win, but this was correct]. Because some abstentionists went to vote in the second ballot, the NF did not take any region at all; it is the first time however that the NF wins so many regional delegates. The SP won only 5 regions, and it lost its Ile de France stronghold; The Republicans won the majority there because left-wing tactical voting and decreased abstentions did not suffice to carry the day. Where the SP has no representation at all because it did not even stand, it will have no possibility to bring the fight to the right and the extreme right within the Regional Council. Such is the suicidal policy of the Socialist Party, and Hollande implements none of the promises that got him elected. Dissent grows in the party because the government has no answers to the problems of the social emergency. Growing inequality causes explosive problems, particularly in the less well-off areas. Unemployment grows, but the talk stays at the level of the need for austerity, cuts in State credits, and the need to stop djihadist “radicalisation” in the young. Associative structures that had been essential to social cohesion at local level, are dropped. This goes for the social centres, the youth and cultural centres, the street educators. In some Regional Councils recently fallen to the right, the financial means to keep a decent level of culture are cut. The Front de Gauche (FdG) lost a lot of support in those elections. In each of its component parts, questions are being asked about the policies up to now. One central concern is about the apparatuses and their roles, and the-now-evident limits of parliamentary politics. Within those limits, every major objective is forced into second place by electoral considerations, the number of seats to be won, etc. It is necessary to understand that the victory of the left can only be conceived within a rupture with the institutions of capitalism. It is essential to allow a real democratic debate in every part of the Front, particularly since the State of Emergency was voted unanimously without any reference to the militants. 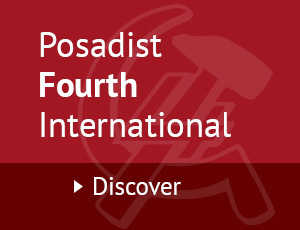 It is therefore vital to re-position the political objectives of the left. The debate must open on how to finish with wars in order to build a new society, return to more democracy and defend the Republic’s values of equality, liberty and fraternity. 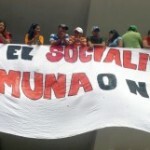 The social emergency calls for struggles against the austerity measures that exacerbate discrimination and inequality.